Hey! Recently, I dug deep into Diego's draws and found his HippyHound collar and leash set. This of course meant he had to add this duo to his rotation of 'outfits' that he wears during the week. I was about to re-post my review of the combo to my social media accounts, but realised I never did post a review even though we got these around a year ago now! 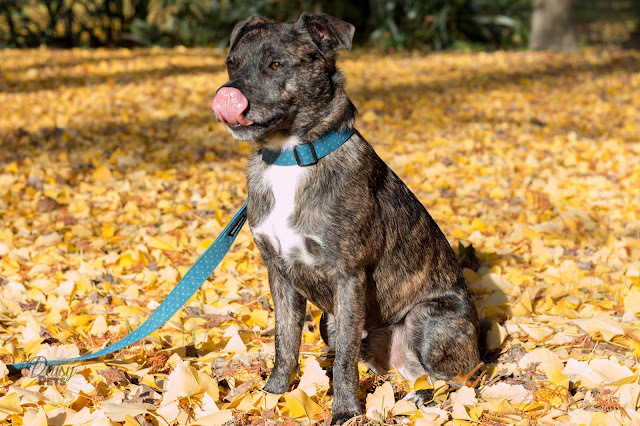 So here's the long awaited review of our HippyHound collar and leash. 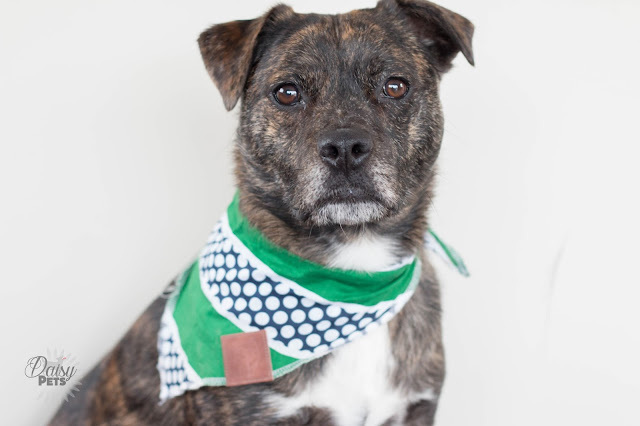 HippyHound is a New Zealand company that makes handmade collars and leashes from fabric sourced at local opshops and garage sales to get a truly vintage, rustic look. 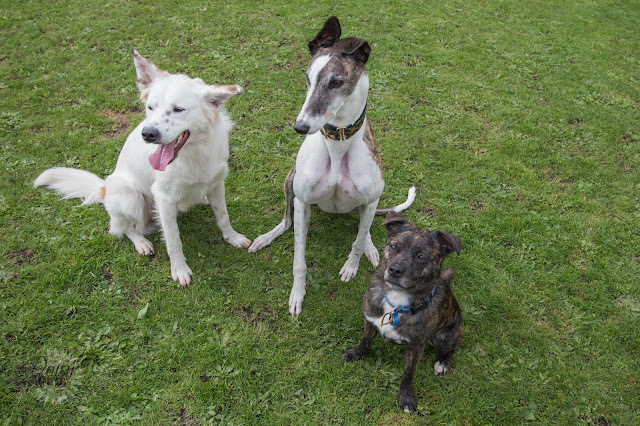 This makes their collars and leashes stand out from the crowd, and have originality you wouldn't find elsewhere. 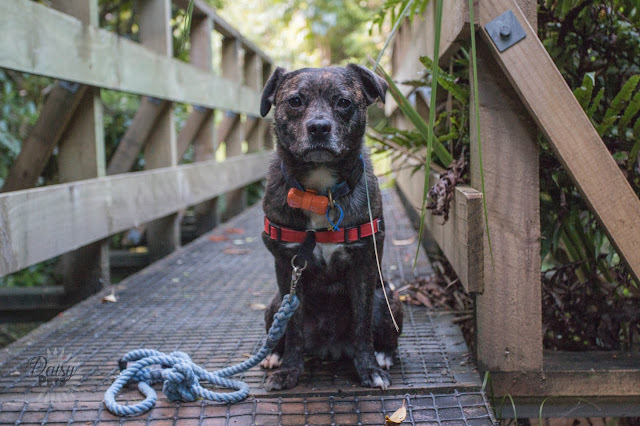 Not only are these leashes eco-friendly by using recycled fabrics, you will also be helping a good cause as 50c from every item sold is donated to dog shelters in Christchurch. Hey! I am a person that has multiple pairs of shoes, each a different colour to try and match whatever sport gear I am wearing on a certain day. I also now am trying to extend that into Diego's wardrobe because he needs to be as much of a fashion mogul as I. He does have a couple of different collars and leads, but my new favourite way to change up his look is with bandanas. I feel like they give him an extra kick to his look, and really increase his street cred. We also always get compliments when he wears bandanas out in public. Hey! 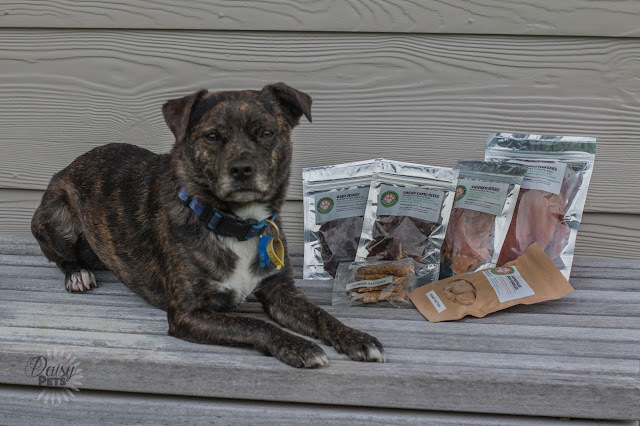 Recently, we were lucky enough to be sent a bunch of Daisy's Doggy Deli treats to try out and give our feedback on. I had recently been very close to running out of treats for Diego so this couldn't have come at a better time! The lovely Suzanne sent us so many different types of treats to try, and I will let you in on a little secret, they are amazing! Daisy's Doggy Deli came to fruition after Suzanne realised what horrible ingredients are added into a lot of the commercial food and treats for dogs and she did not want to be feeding that to her beloved pooch. Daisy herself is a rescue pup, and was originally on commercial dry food, before being transitioned onto a raw fed diet. Daisy's Doggy Deli uses 100% New Zealand grown, free range meat cuts and gives you a treat that you can clearly read and understand everything that is in them! This post isn't really pet related, very loosely tied into my animal loving lifestyle, and I hope you don't mind. Today, in New Zealand, it is Mother's Day which is a day that you are meant to celebrate with your mum. Unfortunately, we are both extremely busy in different parts of the country and I don't get to make her breakfast in bed, or take her out on a brunch date. Instead, here is my open letter to my amazing mother. Thank you for all that you have done for me, and the four other creatures that you call children. The older I get, the more I realise how incredibly hard your job is, but also how you have done it so well. Raising five children is hard enough, but doing it alone for half of them is even harder. You have put your whole life into raising us, making sure that we are happy and healthy, and slaving away at multiple jobs so you can feed our many interests. I am not sure if this is a personal problem, or something that everyone does... but I will religiously do something for ages and then randomly stop and forget about that thing. Only to come back to it months down the track and wonder why the heck I stopped in the first place. This has happened to me recently with taking treats on walks with Diego. I used to do this every walk when Diego was a puppy, and since moving back from Whanganui I have never grabbed my treat bag. What a terrible idea that was.